Jazz lovers have disintegrated into so many factions over the years that they make the socialists look like a well-drilled regiment. Forty years ago, the distinctly unsavoury figure of Miles Davis was considered an affront to the loyal followers of Chris Barber and Monty Sunshine, who, of course themselves were playing an earlier period’s brothel music. By 1987 a few more factions were in the mix. There were people who only liked Herbie Hancock along with people who said no ‘real’ jazz had been made since the advent of Herbie Hancock. Miles by now was an unassailable and moderately saleable icon who could do no wrong. It was Miles who "invented" jazz-rock, funk-rock, jazz-funk-rock, and funk-jazz-rock-jazz-standing-at-the-back -and-let-the-kids-get-on-with-it-rock. All his later recordings were "ground-breaking" while all his earlier work was "seminal". Against this backdrop ‘Sketches of Spain’ is hailed as a jazz classic, particularly by people who like Horlicks with their hash-cookies. As far as I can gather, neither Miles nor his arranger Gil Evans had ever been to Spain. Further, I still wonder whether a tightly-scored medley of tunes by de Falla and Rodrigo is jazz at all. Miles and Gil had already tried more conventional middle-sized group work on the ‘Birth of the Cool’ sessions, at the time a commercial flop; they had even ploughed the depths for forward-thinking black artists with an album of songs from Gershwin’s ‘Porgy and Bess’. My suspicion is they did a Spanish album in much the way modern function bands do a ‘Latin’ number to pad out their set. The result was beautiful music, but maybe we’d better leave it at that. 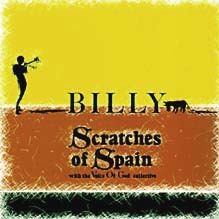 Billy Jenkins’ ‘Scratches of Spain’, like any decent album, works on different conceptual levels. Part homage to a Spanish tour with Ginger Baker; part debunk of polite jazz sensibilities; in a big part simply the best album Billy could make at the time with the best musicians available. It is in every sense a ‘contemporary’ album: referential but rooted in a keen observationalism so often mistaken for pure slapstick. Billy doesn’t call a song ‘Benidorm Motorway Services’ just to get a laugh when he announces it at gigs. The tune is deeply and philosophically about Benidorm motorway services and to miss that is to miss the point. Another point must be made about technique. Parody is meant to sound easy and stupid. In fact you have to be pretty good to intentionally sound ‘bad’ for musico-impressionist purposes. Billy’s music is never a row, although occasionally it is a highly organised impression of a row. The guys in Billy’s bands comprise a who’s-who of top European jazz talent, and it is down to Billy’s unique gifts as composer and musical director that he always gets them to sound, well, very Billy Jenkins. He gets unfair comparisons with Spike Jones and Victor Borge. What he does on ‘Scratches’ shows him on the trail of Sun Ra, Mingus, and the later Ellington. Jazz as a concert art form, drawing for its art upon the varied influence of ‘real’ life. Billy’s jazz music always betrayed a sophistication beneath the jokes. A musical joke is a pretty sophisticated thing in any case. Gil Evans’ Spain is atmospheric, whimsical, full with bass flute trills and arid French horn horizons, not completely unlike Clint Eastwood having breakfast in a Mexican hotel. Billy’s album shouts modern life at you from the off, with a high-energy funk and some ballsy uplifting lead guitar work. Wailing keyboards, more James Brown than Bob James; a lip-trill or two on a fancy trombone; and then two or three choruses of flowing sax. This is jazz that puffs and sweats; the most ‘non-cool’ music you’re ever likely to hear. The second track, ‘Cuttlefish’, combines off-the-wall percussion with a deliberate swipe at the Gil Evans sound using flutter-tongued reeds and Milesish muted trumpet. This is joined by some movie-house organ and the mood continues, slightly submarine and just a bit menacing. ‘Barcelona’ is where Miles Davis meets his dopple-ganger, his scruffy pissed brother-in-law, his coup pas de grace. Anyone familiar with ‘Sketches of Spain’ recalls how wistful Miles is interrupted by a full marching band, arpeggiated trumpets and snare-drums. In Billy’s ‘Barcelona’ we get the wistful lilting Dai Pritchard on clarinet, interrupted by a ragged mocking tune, as diabolical as it is hilarious. A few Dwayne Eddy impersonations later, and the guitar and tenor sax duet with an eloquence gloriously at odds with the ebbs and flows of the ensemble. The percussion fades beneath a clarinet reprise, and what was the end of side one on the original vinyl tip-toes out as you wonder whether you can ever take Miles’ ‘Sketches’ seriously again. Side two opens literally inside Benidorm motorway services. We can hear the piped Herb Alpert muzak. We can taste the plastic cups and the super-heated plastic coffee therein. All about are sticky children and their thin-tempered parents; weary travellers hungry enough to eat anything, which is just as well because they’re going to. Resolutely pissed off trombone argues with a trumpet but it’s all ok when washed down with a carton of generic cola. We’re on a concrete pleasure cruise where the swoosh of the waves and the rumble of the traffic are indistinguishable, interchangeable. Trombone still arguing at the fade; a triumph of implied tackiness lingers. ‘Bilbao/St Columbus Day’ is a riotous Spanish carnival, where trumpet and baritone sax take turns livening up themselves, while squeaky clarinet does something akin to Fats Waller’s ‘Jeepers Creepers’. The percussion dazzles, sounds like about nine blokes playing it, and it is they who play us out. ‘Cooking oil’ couldn’t be more different. Sonorous ‘cello gently declaims a hymn-like melody which grows more impassioned amid bell-like punctuation. This segues into the last track, ‘Mc Donalds’. Jenkins himself rages in the background while brass plays impressions of a naff trad gig. The spirit though is firmly in genuine free jazz, as clarinet and trombone take turns exploding with the unexpected. The assembled forces eventually implode into double-tempo knitting before someone apparently drops a very large dustbin lid to close the show. ‘Scratches of Spain’ is definitely irreverent: a big part of its charm. It also embraces the breadth of modern humanity on a poetic scale, as Jenkins’ brash fulsome approach runs the gamut. This is much more than novelty jazz; this is a collection of very fine British jazz musicians doing something a little more relevant than ‘Girl from Ipanema’ on F major seventh while the beer gets warmer. Much that is called contemporary jazz should hang its fashionably-hatted head a little while the punters munch their pizza. Thesedays Billy Jenkins concerns himself in the blues, with the same angry spirit and intensity. His music rings in the ears like a man yelling that the house is burning down; and it still is.